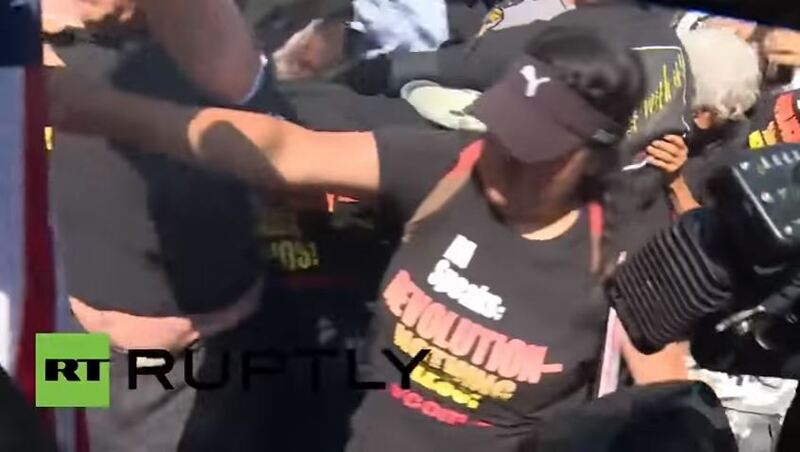 A protester wearing a pro-Communist t-shirt tried to burn a U.S. flag outside the Republican National Convention and ended up setting himself on fire. Firefighters extinguished the fire and no serious injuries were reported. Moments after the flag was set on fire, officers charged in to put it out with an extinguishing spray that some in the crowd thought was pepper spray because of similarities in the design of the canisters and the eye irritation caused by the fire-suppression substance. The skirmish erupted just outside an entrance to the arena and near a row of popular restaurants where cable news networks had set up for the week. Here’s video of the incident, courtesy of RT America. Seventeen people were arrested Wednesday.